A.J. 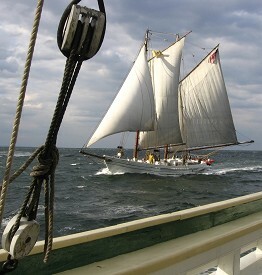 Meerwald is New Jersey's official Tall Ship. She is an authentically restored 1928 Delaware Bay oyster schooner, and today serves as a classroom afloat, teaching everything from the history of Delaware Bay oystering to present day water quality issues. 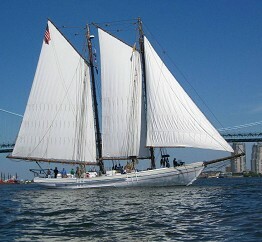 She is owned & operated by a non-profit educational organization, the Bayshore Discovery Project. A.J. Meerwald visits coastal cities and towns throughout New Jersey, Delaware & Pennsylvania, and from time to time ventures into Chesapeake Bay and the Northeast Atlantic Seaboard. Students range from 4th-graders to adults. In the summer A.J. 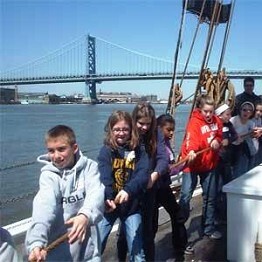 Meerwald hosts summer camps for kids ages 13 to 16, who learn how to sail a traditional schooner as well as aspects of environmental science. They learn teamwork, self-discipline and leadership, while setting & trimming sails, practicing coastal navigation, working in the galley, and doing all the activities that a working crew performs. The professional crew have many years of experience in sail traiing and environmental education, and serve as mentors in hands-on education. For teenagers this can be a life-changing experience.